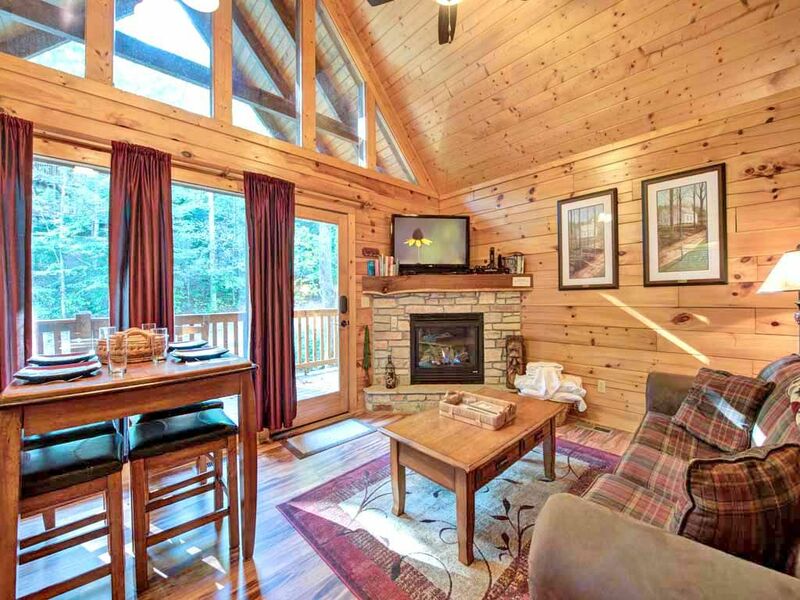 Even before you step foot inside Southern Serenity you can see why the 1-bedroom log cabin is ideal for a romantic getaway. Set among leafy tulip trees and lush shrubbery, beside a pond and looking out toward a waterfall, it’s like something out of a storybook. Thanks to the porch that runs across the front and one side of the cabin, you’ll be able to revel in the delightful view anytime. When you’re not kicking back in one of the rocking chairs (what’s a mountain cabin without a porch rocker? ), you can listen to the breeze rustle through the trees while soaking in the outdoor hot tub—how blissful! What’s more, if you’re bringing a four-legged friend along, Southern Serenity has a pet gate so that he or she can enjoy the view along with you. The inside of Southern Serenity is just as charming as the setting. The burnished wood floor, walls, and vaulted ceiling gleam, especially when illuminated by the golden glow of the stone-surround gas fireplace. The living room’s roll-arm sofa invites you to snuggle as you watch a movie on the HDTV with cable—and not only is there a Blu-ray player, but there’s also a library of movies. Make some popcorn, open a bottle of wine, and enjoy your time alone. Or feel free to invite friends (or the kids) along: The sofa can open into a bed for 2, enabling the cabin to sleep up to 4 people in all. Despite the bucolic surroundings, Southern Serenity is only a few minutes’ drive from downtown Gatlinburg, where you’ll have a fabulous range of restaurants to choose from. Sometimes, though, it’s even more romantic to dine at home. Fortunately, the kitchen is outfitted with all the appliances, cookware, and tableware you could need, whether you’re preparing a full-blown feast or simply whipping up a batch of daiquiris to enjoy out on the porch as you gaze up at the stars. For a different sort of entertainment, head upstairs to the loft, where you’ll find a full-size billiard table. If you never learned to play, here’s your chance! Between shots you can watch your favorite program on the game room’s TV. We’ve saved our favorite room of Southern Serenity for last: the bedroom. The king-size bed is so sumptuous, you just might find it tough to leave in the morning. Fortunately, there’s a TV to keep you entertained, as well as free WiFi. When you’re not lounging in bed you can laze in the en-suite bathroom’s jetted tub. No matter how knotted your muscles are after a day of hiking, biking, skiing, or white-water rafting, after a soak, they’re sure to be wonderfully relaxed—and you will be too! When you arrive at Southern Serenity, you’ll find the bed impeccably made up and plenty of fresh towels and extra bedding waiting for you. For added peace of mind, Southern Serenity is thoroughly cleaned using non-chemical products. Among the cabin’s other conveniences are a dishwasher, a washing machine, and a dryer. These time-savers will free you up to explore everything the area has to offer. And that’s a lot. For starters, because Southern Serenity is part of the Black Bear Falls community, in the summer you can use its heated adult and children’s swimming pools. What’s more, not only is the cabin close to the attractions of downtown Gatlinburg, which include an aquarium, museums, and mini golf, but it’s also near the Great Smoky Mountains National Park, Ober Gatlinburg Amusement Park and Ski Area, and the Gatlinburg Arts and Crafts Loop, an 8-mile trail of more than 100 galleries, studios, and craft shops. Of course, you could easily have a memorable stay simply exploring the creeks and ponds surrounding the cabin, relaxing in the hot tub, and savoring the birdsong and fresh mountain air from the porch rocking chairs. Whether you want your getaway to be action-packed or laid-back, Southern Serenity is an idyllic home base. Don’t miss out; make your reservation today! We stayed for 3 nights, cooked at home twice but eat out on the town the other. Had a lot of fun, no neighbors, super quite and peaceful. I bet, we were the loud ones! My husband and I went up for my birthday and stayed in your cabin. It was beautiful. Great location. We had a small problem upon arrival. The sheets on the bed were covered in black dog and human hair. We called the management office and said they would send housekeeping to change them and we did not have to stay around. When we can back around 9 pm we found the new sheet hanging on the door knob outside the cabin for us to change. Then later that night it got really cold and we could not turn the heat up over 75 degrees. The thermostat is controlled from the office on how high you can turn it. Finally they sent out an A/C man and he fixed it so we could turn it up to get comfortable enough to take showers. All in all it was a great vacation and birthday and the cabin was great. We have no regrets. Wayne, thank you for taking the time to review your stay at Southern Serenity. We appreciate your feedback. Our housekeeping team has since sent the sheets for deep cleaning. Thank you for letting us know, so we can better the stay of our guests. We are pleased to hear you enjoyed your stay and we hope you book again soon! Great cabin and great location! The cabin was very nice and easy to get to town. Cabin was very cute! Perfect for 2 people! Enjoyed our stay! Black Bear Falls Community is the perfect location. Convenient to both Gatlinburg and Pigeon Forge. Love it that each Cabin is tucked away amongst the trees and they are not right on top of each other. The cabin, Southern Serenity was perfect for our long weekend getaway. We enjoyed it and hope to return soon. Thank you for allowing our 2 dogs. They loved it too! 1. Curtain rod kept falling every time we tried to close and open the drapes for privacy. 2. Shower curtain liner is too short and water escapes onto the floor. 3. Mattress needs a protective pad/cover for sanitary purposes. 4. Pillows need protective covers too. Also for sanitary purposes. Over-all, great place to stay! Sabrina, thank you for leaving a review for your stay at Southern Serenity. We very much appreciate your suggestions and will pass them on to the owner and housekeeping. Thank you for letting us know how we can improve the Jackson Mountain Homes experience for all our guests. Don’t forget that next time you stay with us, you will receive a 10% return customer discount that can also be used in our other locations such as: Hilton Head, Florida, New Mexico, and Hawaii. The cabin was clean, equipped with basic necessities. The only complaint was that the tv’s were given me problems & the response time to fix it could have been better. It seems like they didn’t care that there was an issue. Donna, thank you for taking the time to review our property, Southern Serenity. We sincerely apologize that you did not have use of your TV for part of your vacation. Hospitality and service are our top priorities. We are sorry that we fell short on these standards during your stay. These issues have been addressed at Southern Serenity. Your input and all of our guests' feedback is vitally important to us, as we want all of our guests' expectations to be met upon arrival.